Big Sky Airlines was an American regional airline that operated from 1978 to 2008. Headquartered in Billings, Montana, United States. Big Sky was wholly owned by Big Sky Transportation Company, a wholly owned subsidiary of MAIR Holdings. The airline was established in 1978 and started operations on September 15, 1978, initially operating to a number of small cities in eastern and central Montana formerly served by the original Frontier Airlines. This remained the core of the company's business throughout its history, although the airline also expanded into a number of other geographic areas over the years. Most of the later expansions proved to be short-lived, however. Big Sky started to take over Exec Express II d/b/a Lone Star Airlines/Aspen Mountain Air's EAS routes in October 1998, following their bankruptcy. Transfer of services was completed in December 1998. In late 2002, Big Sky Airlines offered service between Idaho Falls, Idaho and Denver, Colorado but canceled it three months afterward, declaring it unprofitable. In early 2005, Big Sky announced a few changes to its service, planning the termination of service to North Dakota, and replacing its Metro fleet with Beechcraft 1900Ds which were leased from Mesa Air Group subsidiary Air Midwest. In February 2006 Big Sky began daily service between Walla Walla Regional Airport(ALW) and Boise(BOI). Service ceased with the airline's bankruptcy in 2007. In July 2006, Big Sky announced that the airline would discontinue service to Great Falls, Montana; Kalispell, Montana; and Spokane, Washington. The airline also announced that one of their Beech 1900D's would be leased to an airline in Florida. On September 1, 2006, Big Sky discontinued service to Moses Lake, Washington. 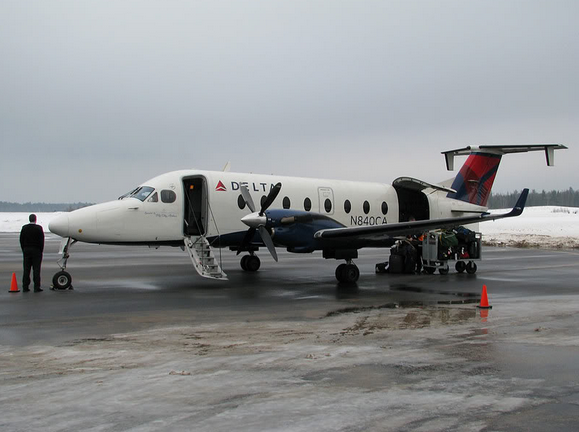 On December 21, 2006, a press release announced that Big Sky would become a Delta Connection carrier, using eight Beechcraft 1900D turboprops out of Boston's Logan International Airport. The airline's east coast operations ended on January 7, 2008. 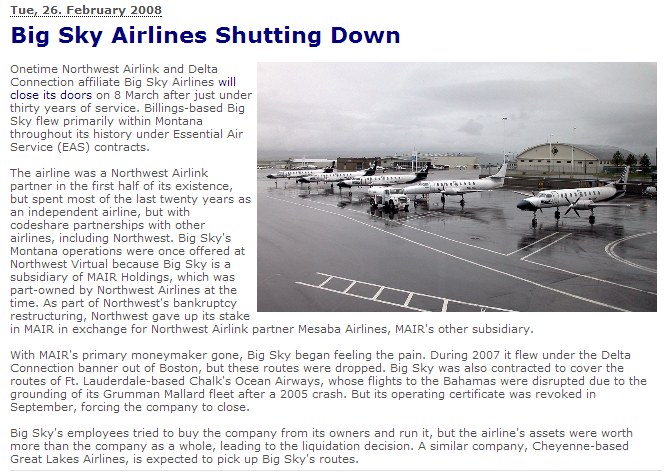 On December 20, 2007, Big Sky announced that it would more than likely cease operations within 60 to 90 days. This was due to the loss of the Delta contract, unusually bad weather, disappointing revenue and record-high fuel prices. The remaining Beechcraft 1900D aircraft are be auctioned off and proceeds returned to MAIR holdings stockholders. When this happens, the airline will be disbanded. 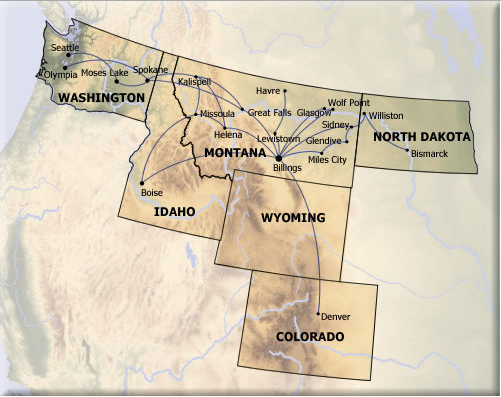 In late 2007 Great Lakes Airlines was given USDOT approval to take over EAS service to and from Billings, Montana and seven other Montana cities currently served by Big Sky. Great Lakes Airlines began flying the routes in 2009, only to be replaced with Gulfstream International Airlines (now named Silver Airways) by the Montana Essential Air Service Task Force in January, 2011. Big Sky's final scheduled flights arrived in Billings on the morning of March 8, 2008; that morning, the three final flights marked the end of the airline by performing a joint flyover of the Billings airport prior to landing.